Mormon Mommy Writers and Friends: The Clarion Call- Are You Ready? Okay, Mormon Mommy Writers- did you hear the messages that were just for us in this past weekend's General Conference sessions? Because I did. There were several that spoke to my heart, but the one I wanted to share with all of you today was this one from Elder Gregory A. Schwitzer. "If ever there was a time when the world needs disciples of Christ who can communicate the message of the gospel with clarity and from the heart, it is now." Guess who can do that? Us. Writers. Writers who know the truth. You and me. Elder Schwitzer spoke of Jesus Christ as our perfect example in this, saying, "He was not afraid to speak against the earthly powers or rulers of his day. Even when such were opposing the mission given to Him by His Heavenly Father. His words were not designed to confuse, but to move the hearts of men. He clearly knew His Father's will in all He said and did." Another wonderful example was Peter, whose words, spoken as he stood up against those who would mock the church, converted thousands. Elder Schwitzer said, "This is powerful evidence that one man- or woman- who is willing to testify when the world seems to be going in the opposite direction, can make a difference. When we as members make the decision to stand up and powerfully witness for God's doctrine and His church something changes within us. We take His countenance upon us. We become closer to His Spirit. He in turn will go before us and be on our right hand and on our left, and His Spirit shall be in our hearts and His angels round about us to bear us up. True disciples of Christ are not looking to make excuses for the doctrine when it doesn't fit the world's concepts." He went on to say, "True disciples represent the Lord when it may not be convenient to do so. True disciples desire to inspire the hearts of men, not just impress them. Often it's not convenient or comfortable to stand up for Christ." Can we do it? Can we stand up for Christ? We certainly need to, because as Elder Schwitzer said, the world is pulling in an even more dangerous direction. 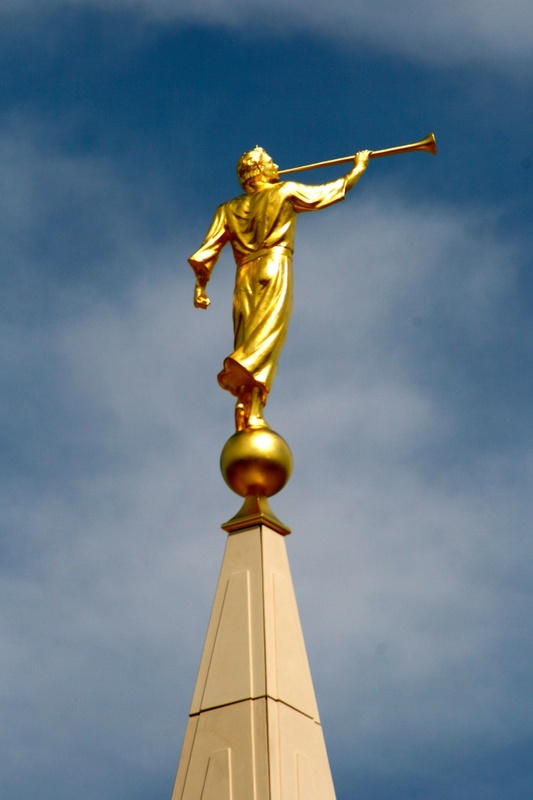 When talking about the "great and spacious building" from Lehi's dream in the Book of Mormon, Elder Schwitzer said, "For years, I thought the mocking crowd was making fun of the way the faithful lived their lives. But the voices from the building today have changed in their tone and approach. Those who mock often times try to drown out the simple message of the gospel by attacking some aspect of the church's history or offering pointed criticism of a prophet or other leader. They are also attacking the very heart of our doctrine and the laws of God, given since the creation of the Earth. "We as disciples of Jesus Christ and members of his church must never let go of that iron rod. We must let that clarion trumpet sound from our own souls." I believe that Elder Schwitzer was speaking to you and me when he said, "As Latter-day Saints it is time for us to stand up and testify. It is time for the notes of the melody of the gospel to rise above the noise of the world." Let me add my testimony to Elder Schwitzer's and say that as Mormon Mommy Writers it is time for us testify through our words, using the talent God has given us. When we come across these voices of the world who are shouting so loudly that abortion is okay, that marriage isn't that important, and that Christians are bigoted hypocrites, we cannot turn our heads anymore and pretend we don't see and hear. We have a unique gift to communicate in ways that others do not, and I know that when we allow the Spirit to work through us we have that power to make a difference, just like Peter did. If you feel like you don't know enough, it's time to study. If you feel like you aren't close enough to the Spirit, it's time to pray. If you feel like you aren't strong enough or brave enough or tough enough, it's time to trust in the Lord and let His strength, courage, and resolve bear you up. Last week on Facebook I had an experience with this: our local news station shared a story of a woman who had intentionally blinded herself, because she had felt her whole life that she was meant to be blind. She found a psychologist who was willing to help her, and together they poured drain cleaner in her eyes. The comments on the post were things like, "That's crazy! Why would anyone do that to themselves?" and "That psychologist should be arrested," and, "Mental illness can make people do awful things!" and other such things. One commenter said, "I've seen this before- there was a guy who thought he should only have one leg so he cut off his leg. Crazy! Why would someone do that?" There was something so obvious here, something so blatantly obvious about these appalled comments versus what the world has been applauding lately with magazine covers and awards for courage. I didn't want to say it. I knew I'd get slammed. I knew it would fill my e-mail inbox and my Facebook with contention and negativity- the last things I wanted. But I knew it had to be said. If you don't say it, who will? I heard in my head. "I've heard of this sort of thing before too. There was this one guy who thought he should have been born a woman so he actually had surgery to remove perfectly good, healthy, functioning parts of his body- and a psychologist helped him do it. It's amazing the damage that mental illness can make people do to their bodies." Surprisingly, what followed was silence, punctuated only by several likes and one other comment in reply to mine saying, "^This." I don't know if the post just got lost in the ether, but I'd like to think that perhaps I made some people reexamine some of their opinions and attitudes, if even just to plant a tiny seed of truth in their minds. This experience taught me to be brave, to speak out, because I have a unique perspective to offer the world, and what I have to offer might just be the one thing that changes someone's mind, that turns them a little bit closer to the truth. I certainly hope so. How have you spoken out in the cause of truth? If you haven't, will you try? heh. My post I've been doing for Saturday is along these same lines. It's related to a different talk though... hmmmm.... I wonder if maybe there was a theme there for us MMW-and friends-? ?